A complete lack of bodily awareness! Movement skills are often a forgotten step in health and fitness. The usual thought process of an individual participating in a sport goes something like this. 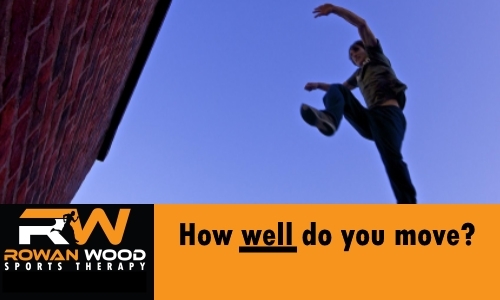 First comes the medical check: “Am I fit and healthy with no medical conditions or injuries to stop me exercising?” If this is a pass, then it’s straight into exercise with the focus on quantity, rather than quality. How far/fast can I run? How much weight can I lift? The lack of attention to movement skills even occurs in skill based sports such as tennis or football. While the highly movement based, sport specific skills are honed, the more fundamental movement skills are often forgotten. For example a tennis player may be able to hit a killer forehand. If however they are hitting the ball from an unstable position with poor joint alignment, the ability to move effectively for the next shot may be impaired, and extra stress will be placed on the joints, leading to excess wear and tear. The same happens in institutions that physically test their recruits such as the police force. First the recruits take a medical test, and if they are fit they are put straight into quantitative tests such as lifting, carrying, running, timed obstacles etc. Movement skills are almost entirely neglected. What is missing in these situations is the fundamental step of asking “do I have the movement skills, co-ordination and motor control to do the tasks I aim to do?” It is normal for people to play sports, lift weights, run, or perform a physically demanding job for years and only focus on the quantity and not the quality of what they do. So if people can carry out these activities, often to a high standard, why worry about movement skills? A little history will help to put things into context. Our bodies evolved to move. Before modern life developed, we relied on our bodies to run, climb, hunt, throw and more, all just to stay alive. Over the last few thousand years, our society has changed unimaginably, yet we are still stuck with the same prehistoric bodies that our ancestors had. Over the largest stretch of our evolution, there was no such thing as a flat road or pavement. We didn’t live in buildings with even floors and uniform stairs – we had an infinitely variable landscape to contend with on a daily basis. We didn’t have the luxury of being able to spend the majority of our day engaged in sedentary activities (ie sitting) – we were forced to be constantly on the move to ensure our survival. We didn’t have the option to have food delivered to our door in convenient packages – we had to explore our environment to hunt unpredictable prey and forage in a multitude of different ways. Now that modern society has taken away this constant stimulation from movement, our bodies can start to fail on many levels. Our nervous system starts to misfire, making muscles appear weak or inactive. This in turn can affect balance and stability, resulting in excess stress being placed on tissues that aren’t as well suited to take that stress. Co-ordination skills can become seriously impaired, meaning we lack the confidence and fluidity that comes with good movement. This can make our movements inefficient and put our joints in compromised situations where they risk injury. Going back to the original question – why bother with movement skills if we are able to lift heavy weights, play tennis, run a marathon or even just do the weekly shopping, with poor movement skills? First and foremost, good movement skills contribute to a lower risk of injury and to a higher level of performance. Fluency of movement leads to higher levels of confidence, greater efficiency, a preparedness to cope better with the unexpected, and the ability to avoid putting our joints and tissues in compromised positions. For any athlete, the twin goals of performance and robustness are of vital importance, and improved movement skills are an indispensable requisite to meet these goals. Moving better also helps to bring more comfort into your daily life even when you are not an athlete. It can help you perform such day-to-day tasks as lifting heavy shopping, getting down to the floor to play with the kids, or even just assuming good posture as you sit or stand at work throughout the day. Performing poorly in these routine tasks is a contributing factor for injury or the development of chronic pain. While perfect bio-mechanics cannot guarantee you a pain free life, poor bio-mechanics can be a significant stress on the system, and removing this stress can only result in positive changes. While the benefits of improved movement can be instantly gratifying, you also need to see how you are protecting your future. As movement guru Ido Portal says, if you don’t use and improve the abilities that you currently have, you may find one day that you are simply unable to move as you would like. Practising your movement skills can also be used for it’s own sake as a personal development tool. Participating in movement based activities such as yoga and Pilates are good for mental health as well as physical health. Taking it a step further you can take part in movement based sports such as parkour, dance, gymnastics and trampolining. Alternatively you can just practice movement for movement’s sake, at home on your own or with a coach or therapist. Working on techniques from the basics, such as simple get-ups, squats, lunges and animal crawls, right through to the more complex movements like handstands, vaults and flips, is simply fun and rewarding. I incorporate the thinking in this article as the main ethos of my work – to heal through exercise. While manual therapy has a crucial part to play in any rehabilitation routine, I always emphasise the importance of exercise to rehabilitate and prevent injury. Not only this, but I pay particular attention to the quality of the movement. I never ask a client to load an exercise with weights or perform it intensely until they have established solid movement patterns. If you want to know how this may be applicable to you and your sport, or would like to challenge yourself to improve movement skills get in touch via my Contact Page or via Facebook.